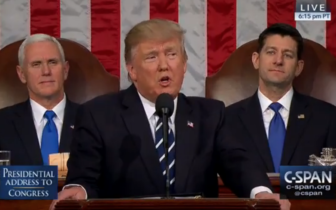 President Donald Trump addresses Congress. Washington – The Trump budget blueprint was silent on the government’s largest social welfare programs, but elimination of federal help to pay heating bills also would cut back on food stamps for about 71,000 people in Connecticut. Food stamps, officially known as the Supplemental Assistance Nutrition Program or SNAP, is an entitlement program like Medicare or Medicaid, meaning that anyone who qualifies receives benefits. President Donald Trump may propose changes in the entitlement programs when he releases a more detailed budget in May. But the “skinny” budget blueprint already would affect many of the 420,000 SNAP recipients in the state. Connecticut is among a small group of states, including New York, Pennsylvania, Rhode Island and Oregon, that boosts the amount of food stamp money to those recipients that receive help from the federal Low Income Heating Assistance Program, which serves nearly 110,000 households in Connecticut. The state received about $88 million from the federal government to fund the heating assistance program this fiscal year. To boost the number of those eligible to receive extra SNAP benefits under federal regulations, Gov. Dannel P. Malloy’s administration gives the minimum $20.01 of LIHEAP benefits to about 71,000 Connecticut households. They receive an average of an additional $112 in food stamp benefits a month. But those extra payments would end if Congress follows through on Trump’s request and eliminates the LIHEAP program. “Everything has unintended consequences, and this is one of those cases,” said Lucy Nolan, executive director of End Hunger Connecticut! and a champion of the food stamp program. She said all of New England, except Maine, has tied LIHEAP to an increase of food stamp benefits. Trump proposed eliminating the LIHEAP program, dozens of others and nearly 20 federal agencies to pay for a boost in defense spending, additional Border Patrol agents and work on a new barrier between the United States and Mexico. But the budget, the president’s first, was panned by most Democrats and some Republicans and is likely to undergo major changes. DeLauro said she is not certain the GOP majority in Congress would agree to restore LIHEAP or other social programs on the chopping block. “We will see when (the budget) comes before the Appropriations Committee,” she said. Several Republicans already have pushed back on the blueprint. White House budget chief Mick Mulvaney on Thursday may have made it more difficult for Republicans to defended the Trump administration’s proposed deep cuts to social welfare programs – which include Meals on Wheels and after-school services – by saying it’s unfair to taxpayers if such programs don’t show hard results.